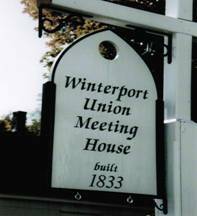 Our purpose is restoration and maintenance of the Meeting House, Winterport’s historic landmark. Officers and board members are elected at our annual meeting. Weddings: The Meeting House is available for weddings. Details are provided in our wedding brochure. For Information on Building Rental: Call Kim Pitula - 207-223-4091, Maggie Flanagan 207-505-5157 or visit our Facebook page. Membership is open to all interested in helping to preserve this building. Dues are $15 for an individual, $25 for a family, Friends $50 -$99, Life membership $500 plus. Become a member today and help support this historical building: Membership and Donation Form. On March 22, 1833 the committee contracted with Calvin Ryder, then a twenty-three year old local builder, to erect the church following plans drawn up by Bangor architect Charles H. Pond for the Orrington Methodist Church. Calvin Ryder later became a very noted Maine and Boston architect. The contract amount was $2,875, less any materials supplied by the committee. Nine months later the church was finished and dedicated on January 1, 1834. Funds for the construction were raised by selling sixty pews at $60 each to 42 families. The bell in the belfry was given by Benjamin Bussey of Roxbury, Massachusetts. It was cast by the firm founded by Paul Revere and bears the marking, Revere Boston". It is one of only 112 known to still exist of the 400 Revere bells cast between 1792 and 1839. The steeple clock, with its four faces, was installed in 1861 with funds raised locally by the church members. It was manufactured by the E. Howard Company of Waltham, Massachusetts and like the bell, can be regarded as an authentic antique with its old and interesting works. Annual appropriations by the Town of Winterport insure it continues to display the time and ring the hour. In 1850 the Methodists organized a Church of their own and the Union Meeting. House became the Congregational Church. Services of that denomination continued well into the next century when membership declined and regular services ceased. 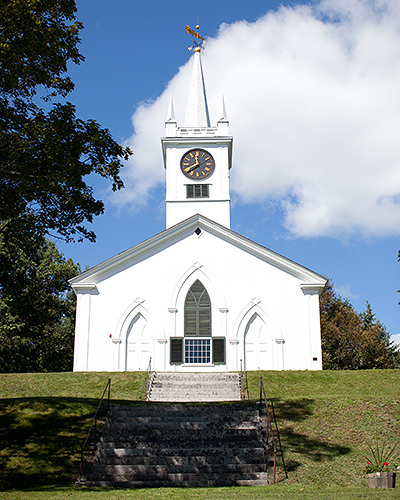 Minimal maintenance was carried on by the few remaining pew holders until 1976 when the Winterport Union Meeting House Corporation assumed responsibility for the maintenance, restoration and preservation of the building. In 1973 the church was placed on the National Register of Historic Places By inclusion in the National Register it is recognized as a part of the historical and cultural heritage of our nation and should be preserved as a living part of our community life and development. Funds for maintenance come from appropriations by the Town, income from a small trust fund, donations; fund raising activities by the members; and member dues.